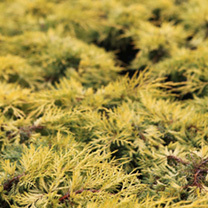 Juniperus × pfitzeriana 'Mint Julep' is a dense, evergreen, coniferous shrub with arching branches and finely textured, scale-like, golden-green foliage. It requires virtually no maintenance and will tolerate almost any well-drained soil type which makes it a great choice for novice gardeners. Height 50-60cm. Supplied in a 5-7.5 litre pot. Juniperus × pfitzeriana 'Mint Julep' is a dense, evergreen, coniferous shrub with arching branches and finely textured, scale-like, golden-green foliage. It requires virtually no maintenance and will tolerate almost any well-drained soil type which makes it a great choice for novice gardeners. Height 50-60cm. Supplied in a 3 litre pot or 5-7.5 litre pot.